This might not come as a complete shock to you but I love pumpkins. I love all kinds of pumpkins. Pumpkins that we grow, pumpkins in a pumpkin patch, stuffed pumpkins that I can hug, pumpkins that light up, cupcakes that look like pumpkins, balloon pumpkins. I love them all. I wear clothing with pumpkins on. Even in December. I love them! One of the most proudest moments of my life was a few years ago when I went to Target the day after Halloween and found a giant light up pumpkin that I have been eying up for 90% off! It was huge! I needed it! I hugged it tightly and rushed to the register. So off I went, struggling to carry and lug this guy home on the G train. Some people smiled at me on the train, some people wondered why I was carrying a glittery pumpkin that had a power cord attached it. But I did not care. This pumpkin was mine and the world was a better place because of it. We went on to name him Big Mr. Pumpkin. (Big Mr. Pumpkin shown here in the middle with his real grown brothers). 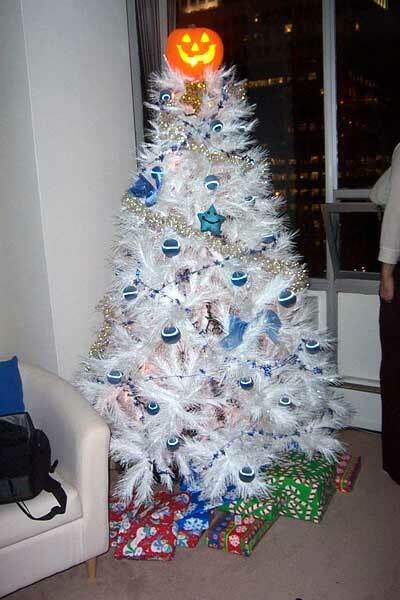 This was our first Christmas tree together in 2003, with a pumpkin on top. We put it up in October and it stayed up until late January! My pumpkin obsession started early on. 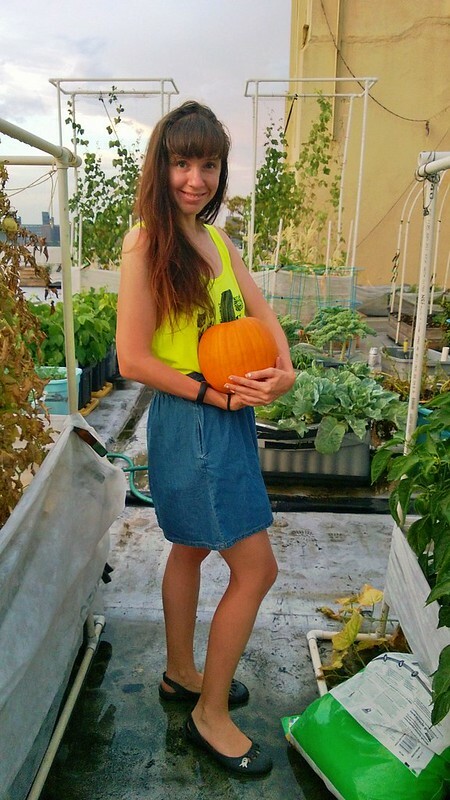 Besides my very strong feelings of all things Halloween, I have always loved growing pumpkins. 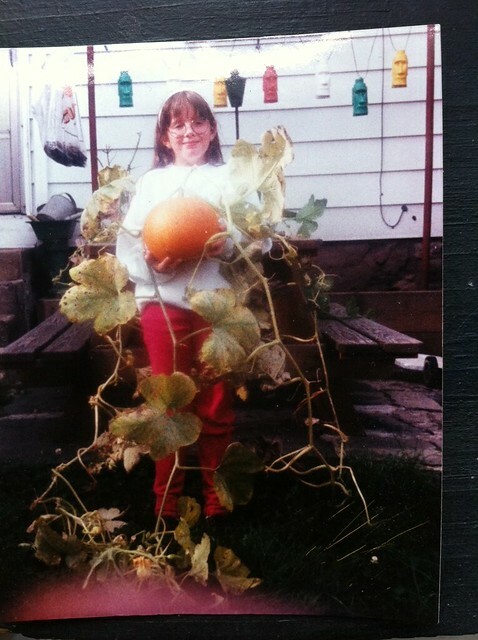 Even in the early years I could be found completely taking over my parents small back yard with my growing all over the place pumpkins. I was so proud of this pumpkin. I also kind of looked like Harry Potter. 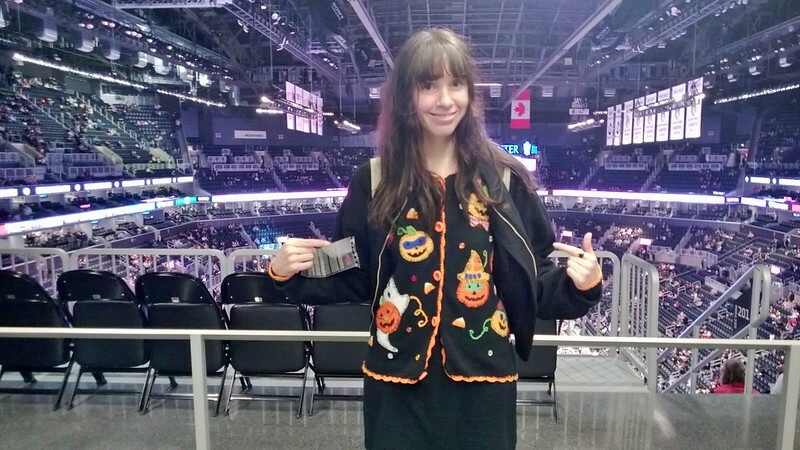 20 years later, my eyesight got better so the Harry Potter glasses weren’t needed but I still love the pumpkins! Today, the pumpkin love is still there, but even stronger. 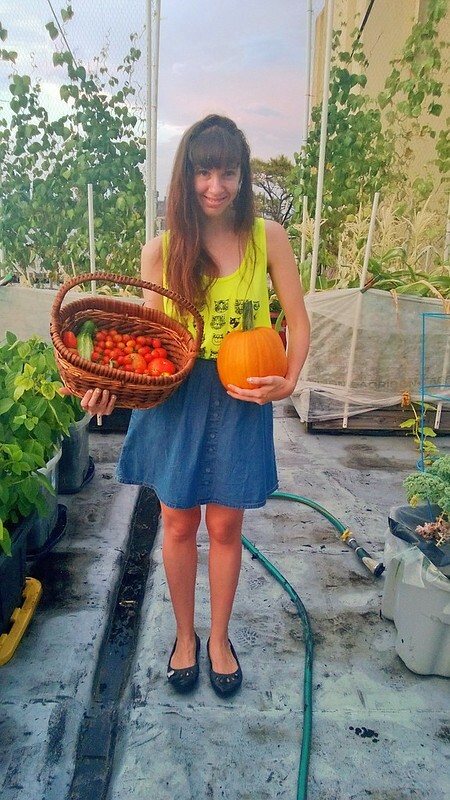 So when we planned on starting the rooftop garden years ago, I had one thing on my mind, pumpkins! Oh yes, we needed the orange warriors of the garden. 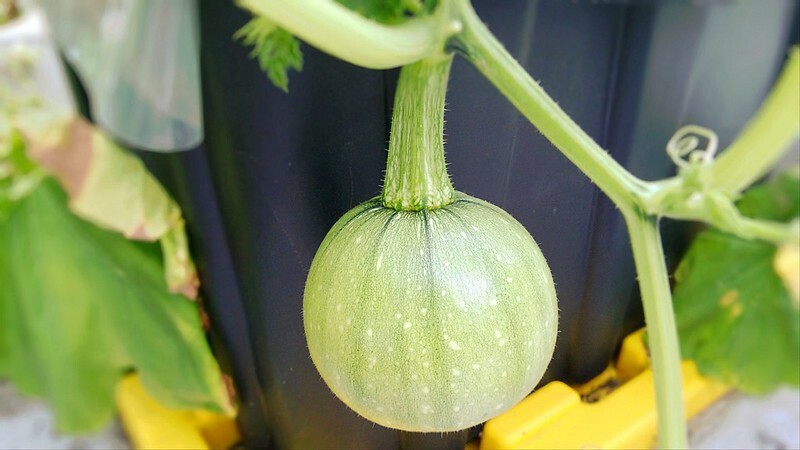 We have worked up to growing pumpkins twice a year because why not? Why not have pumpkins all year in my opinion. We grow one batch to harvest in July and one batch to harvest in October. This means that this month I get to start baking with fresh pumpkin and I absolutely love it! 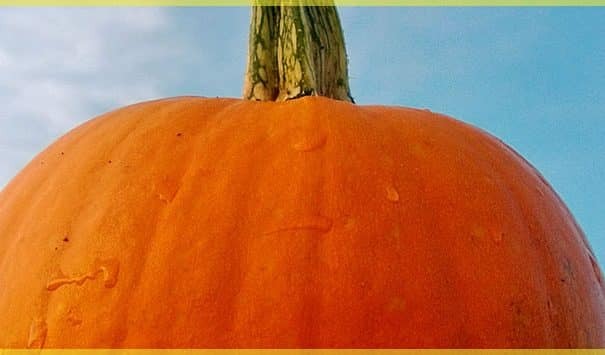 Those are my go to pumpkin recipes and I love each one dearly! Over the next few weeks I will be sharing a few of those and I will continue to share them throughout Fall so when October and November rolls around, we’ll be pumpkin set! Once you bake or cook with fresh pumpkin puree you just got out of a pumpkin, you can’t turn back to the canned stuff. You just can’t. 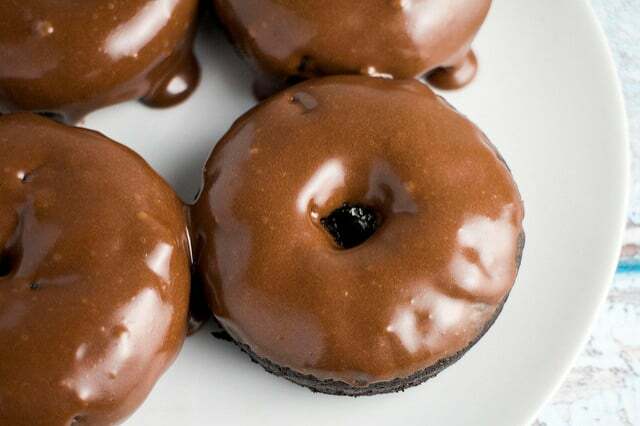 It’s delicious, it’s beautiful. It’s oh my, I love you pumpkins, kiss me please. So let’s not wait any longer, let’s meet our pumpkins we just picked! 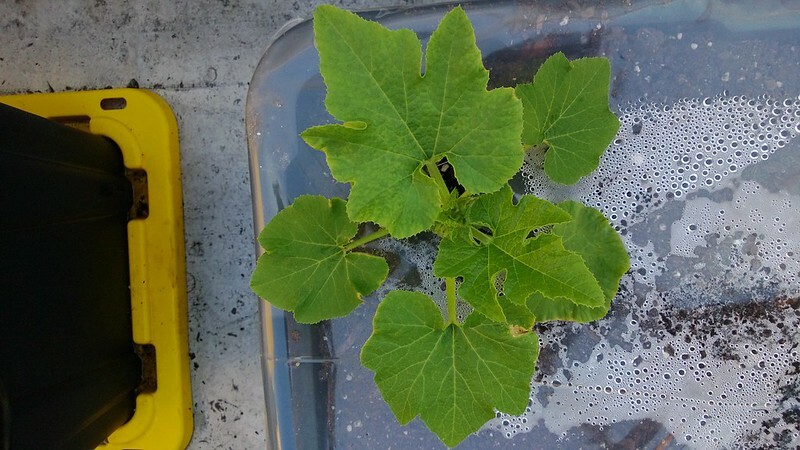 Pumpkin seeds were planted on April 22 and transplanted outside May 20. We grow both Jack-O-Lanterns and New England Pie variety. They were picked from July 18-July 20. 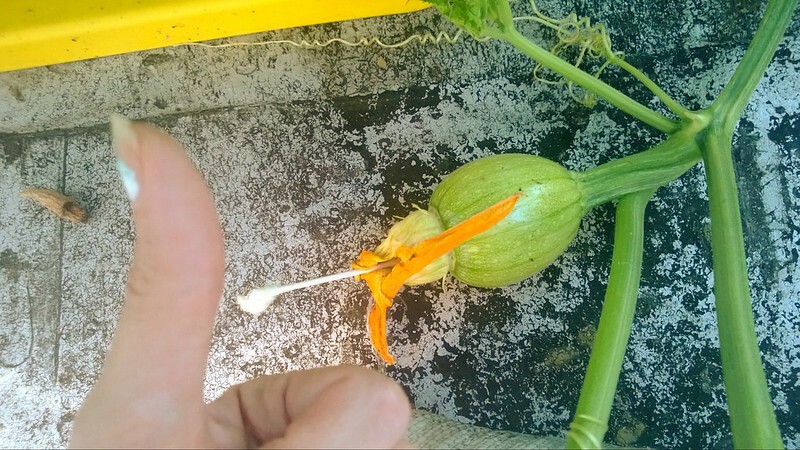 I hand pollinate pumpkins in the very early morning when the female flower is open with Q-Tips and love. Although some people only cook with pie variety pumpkins, I find nothing wrong with using Jack-O-Lantern puree and often use it for baking. Pumpkins biggest enemies are powdery mildew and aphids. The kind of seeds we buy are resistant to powdery mildew. If you see aphids, squish them up with your hands ASAP. 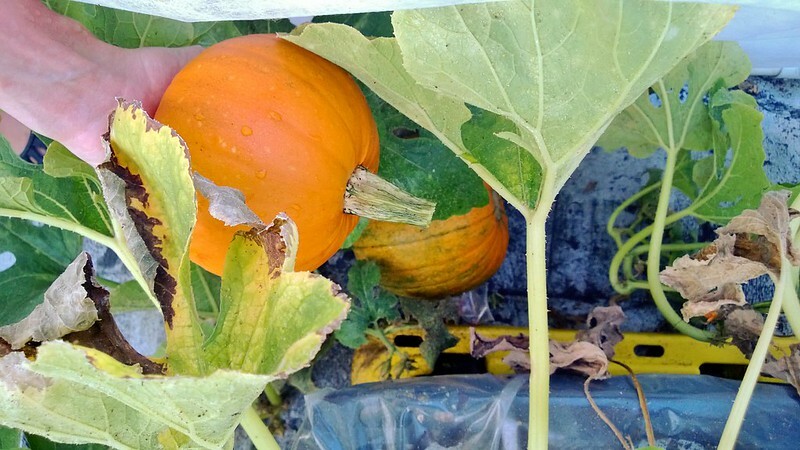 You do not need a big yard or field to grow pumpkins, we grow ours in containers! They were grown in 27 gallon containers. 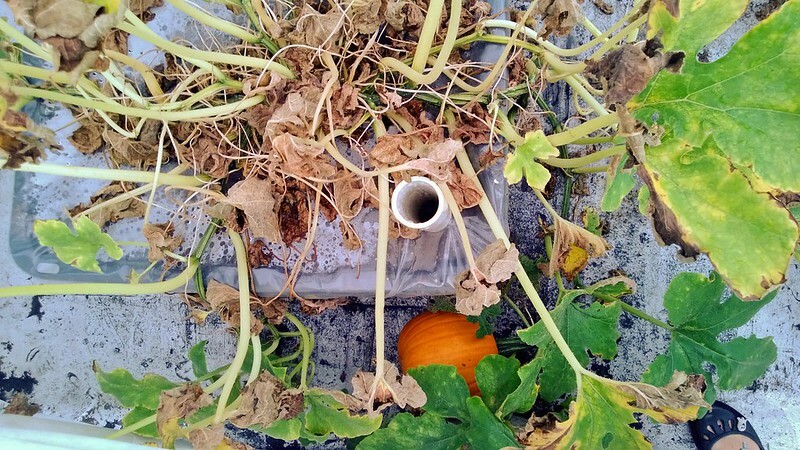 Sub irrigated planters work great for pumpkins! New England Pie are grown 2 plants per container. Leave your pumpkins roam, let them stretch out and take over. Baby pumpkin seedlings, getting ready to go into the big scary world. But it will be ok babies! In just a little over a week one of the seedlings in the picture above turned into this. As soon as they move into their container and can spread out, the plants grow quick! And then I start waking up very early to hand pollinate with a Q-tip. You will know by that later that evening or the next morning if it worked or not. This one was a success! And then it will be ready! 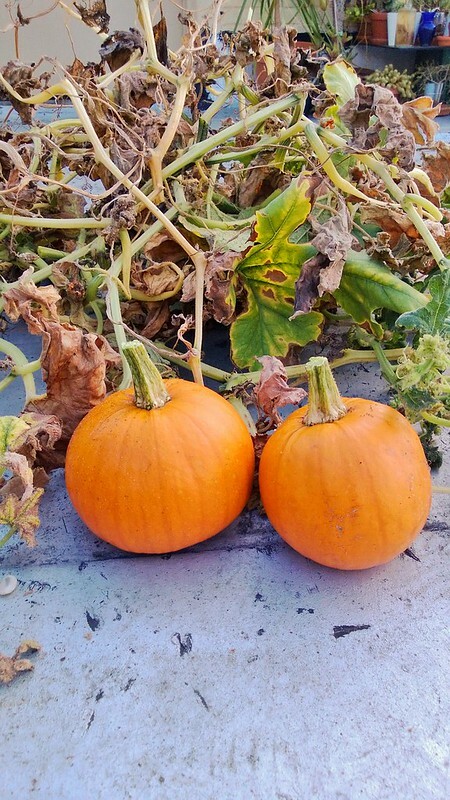 Oh pumpkins, you beautiful darlings you! You make me so happy! You really do brighten my day. You’re my pumpkin sunshine! Great job pumpkins this summer! I will see you soon! 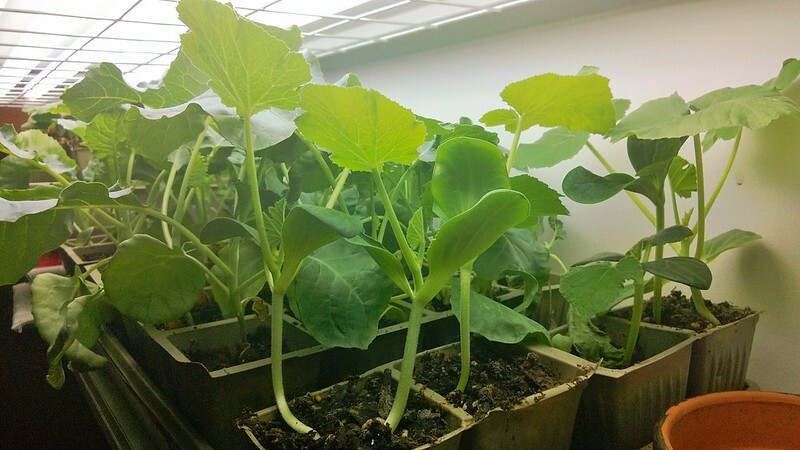 Your brothers, the next batch of pumpkin seedlings, are already growing tall! They will be moving outside soon enough and the cycle repeats..
See your orange beautiful selves in October! The proudest pumpkin mama in the world! Okay, first of all I LOVE pumpkin, too, and I wish I had seen this post in April so I could have planted them myself! Secondly, I think it’s the best thing ever that you looked like Harry Potter- sooo awesome! I think one year I spent literally 1/4 of the year only making pumpkin recipes on my blog but I’ve learned to show some restraint now 😉 Not everyone likes pumpkin 24/7, but at least I know now that you do!! Bring on the pumpkin recipes Koko! How cute are you. 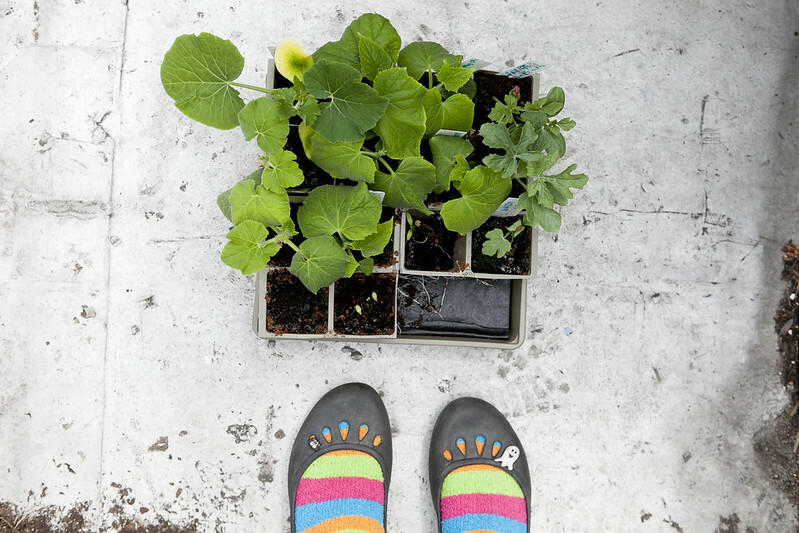 I wish I had a bit of a green thumb as you do. You are just so darn cute with your serious love of pumpkins! Love your Christmas tree with the pumpkin on the top !! Not sure I love pumpkins quite as much as you do (pumpkin on the tree is adorable!) but can you share those pumpkin recipes? They all sound great! I’ll definitely be sharing the pumpkin recipes, I have one coming later this week.. it’s yummy! I hope you have better pumpkin success in the years to come! This is wonderful. I enjoyed this post. So fun. Thanks Hani! 🙂 Have a great day. Awww you’re adorable!! I love pumpkins, too!! Hahahaha.. thanks! Pumpkin love all around! This has me indescribably excited for autumn flavours, particularly pumpkin (and all the range of ingredients it pairs so well with)! Wow you really weren’t kidding when you said you have a long-running obsession… hahah I’m looking forward to all the pumpkin recipes you have up your sleeve. I am very excited for Autumn too, I can’t wait for all things pumpkin! Thanks for stopping by Irina! 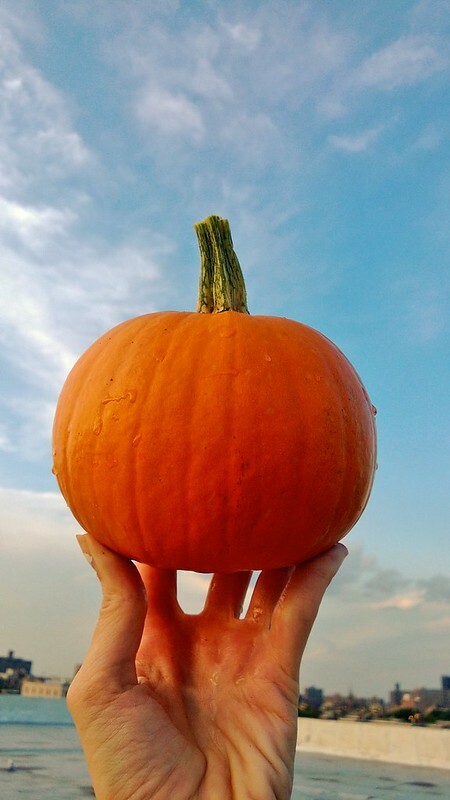 Pumpkins make me happy, I look forward to the fall and buy them little and big to place around the house. They are beautiful and festive and remind me of my favorite time of year. How wonderful you are growing them. I do love your sparkly pumpkin. Thanks Suzanne! It is hands down the beginning of my favorite months of the year! 🙂 Big Mr. Pumpkin says hi! My parents have a HUGE backyard garden – about 25×25 feet. At least half of that has always been devoted to pumpkins because if my mom had her way, she’d only grow pumpkins! This year, my dad put his foot down and insisted they use that space for more watermelons and other crops. A week later, he’d had enough and tilled ANOTHER garden and planted an entire packet of pumpkin seeds. I agree that the comparison between fresh pumpkin puree and canned is just…well ,there is no comparison. I planted chuhaw pumpkins this year but did so supper late. Love, love, love the produce you are getting. Hopefully we’ll be seeing some pumpkin harvest from you this Fall! Good luck! How much fun Pamela!! 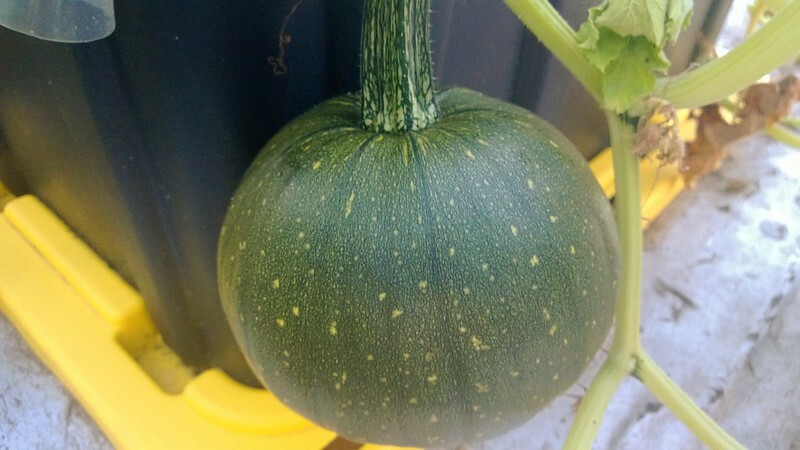 When I was little, my parents inadvertently started a pumpkin patch behind our fence… They carved a pumpkin for Halloween and threw the guts behind the fence and voila! pumpkin patch!! Hahaha Emily, I absolutely love that! It’s my dream come true! That pic of you when you’re little is SO CUTE!!! Your pumpkins are awesome and I can’t wait to see the recipes. I love pumpkins, but mainly because they remind me of fall. I love fall so much. Thanks Amy! Me too, Fall is my favorite, I love everything about it! Aww, thanks so much Kelly! 🙂 I can’t get enough of pumpkins! 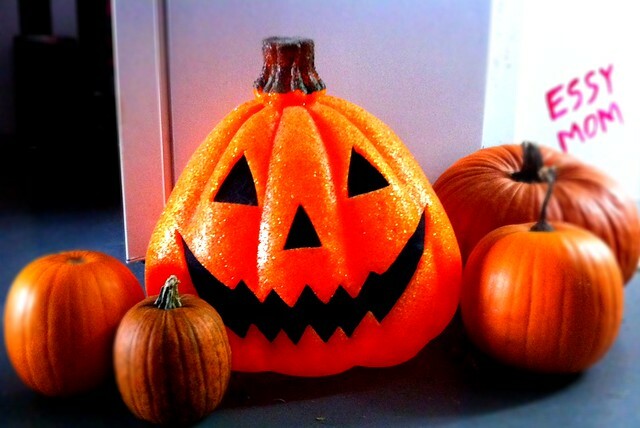 I’m throwing a halloween party in June — any advice on how I can secure a few pumpkins in the next month?